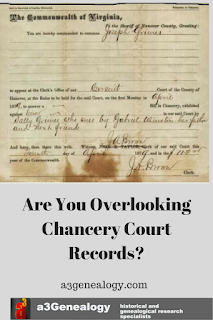 a3Genealogy: Are You Overlooking Chancery Court Records? Are You Overlooking Chancery Court Records? As family researchers and genealogists, one of our common brick-walls is a result of the lack of resources to confirm kinships. Familiar relationships, parents’ names, maiden names are all needed to complete family units, but what happens when we’ve exhausted all the normal resources - census, wills/probates, deeds, vital records, church records…etc.? Well, hopefully the researcher has not overlooked Chancery Records when they are available. What are Chancery Court Records? Chancery Court records hold a wealth of genealogical information. Although not necessarily a part of every states’ historical legal system, when available it will behoove the researcher to take more than a cursory glance at these genealogical-rich documents. Researchers will find personal testimonies that include family relationships. In some states (i.e. 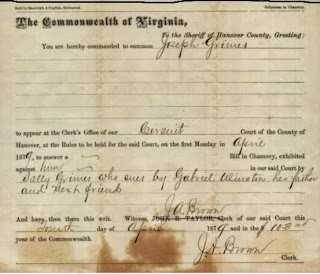 Virginia, Tennessee, etc) chancery court records are available from the early 18th century through early 1900’s. In Virginia alone there are over 233,000 multi-paged cases. More on Virginia Chancery Courts can be found at this informative piece on ancestry.com. A "next friend" can be considered the person who represents and speaks on behalf of the plaintiff. The next friend may be a parent, a guardian, an older sibling , etc. By no means should the researcher assume it is a parent or even a relationship. We have uncovered many next friends proven not to be of blood relation. In many cases the next friend is identified, removing the tempting guessing game and solidly identifying kinships. This is most useful, when also looking for a maiden name. Unlike many states, Delaware's "Court of Chancery" has survived since 1792. Of course its roles, jurisdictions and litigation realms have been consistently updated to meet the needs of the court to include corporate litigation. Visit Delaware Courts for a quick history of the English Origins of the "Court of Chancery." As the times have changed, so has the role of the Chancery Court. 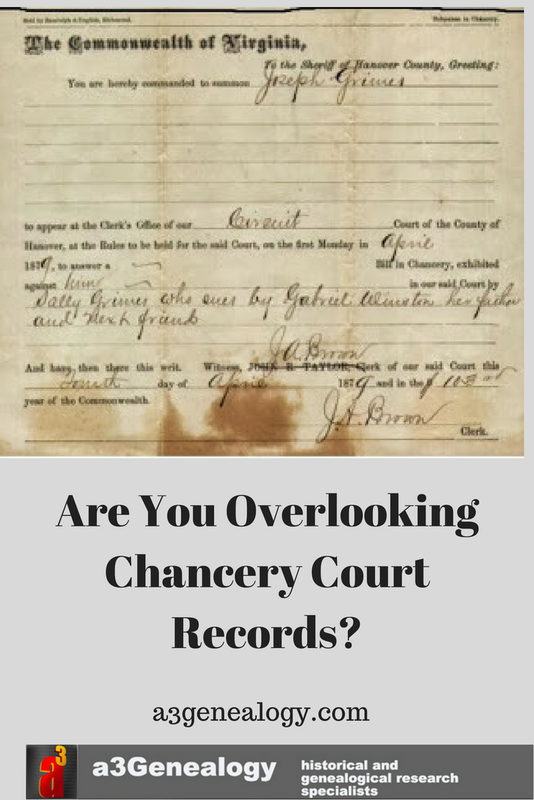 In current day Mississippi Chancery Courts are the repository for land records. Researchers will also find divorces, guardianships and wills in the Mississippi Chancery Courts. Other states like Missouri, may boast of early records of the Chancery Court. For St. Louis MO. Chancery Court Records may be found as early as 1811 to about the Civil War. 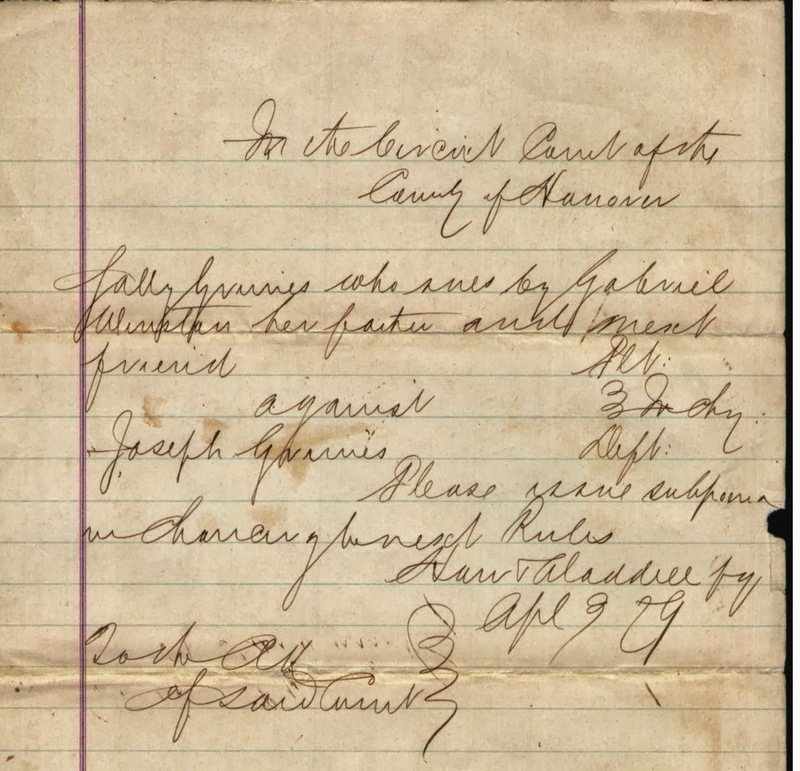 These records can be found at the Missouri State Archives. Like other states, Missouri researchers may find other counties with salvaged Chancery Court Records. Be sure to check FamilySearch Wiki for your state / county. 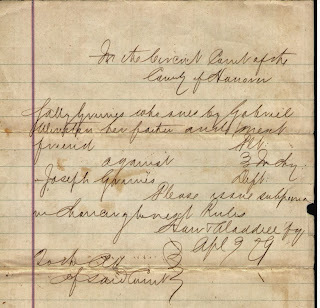 (Updated from Chancery Court Records for Genealogy Brickwalls posted 12 Oct 2013).